I’ve adored wine and everything to do with it from an inappropriately young age, but my passion has grown ten fold since moving to Barcelona. 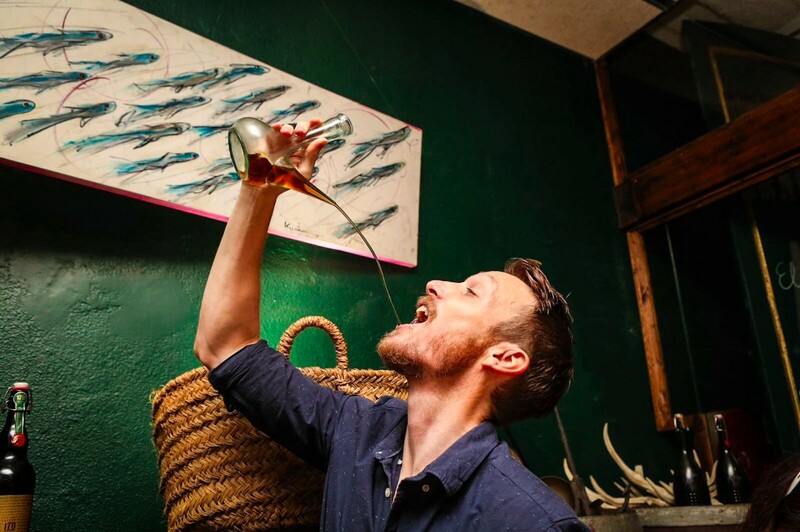 Based on over five years of swirling, sniffing, sipping and… well, not very much spitting if I’m honest, this is my guide to the very best wine bars, bodegas and tastings in Barcelona. Words & photos by your vino-fuelled guide, Ben Holbrook. 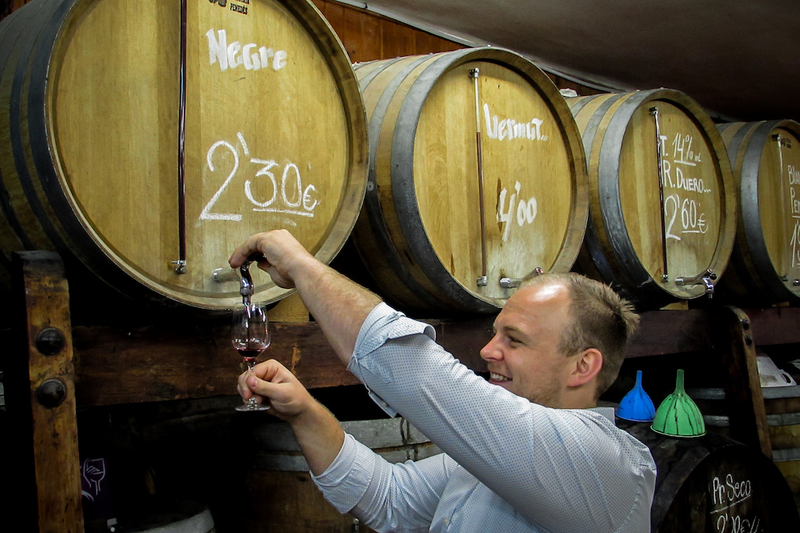 Note: At the bottom of this post I’ve also included advice on the best wine tastings and tours in Barcelona city centre, as well as a few tips on winery tours outside of Barcelona for those interested in exploring the region’s vines firsthand. 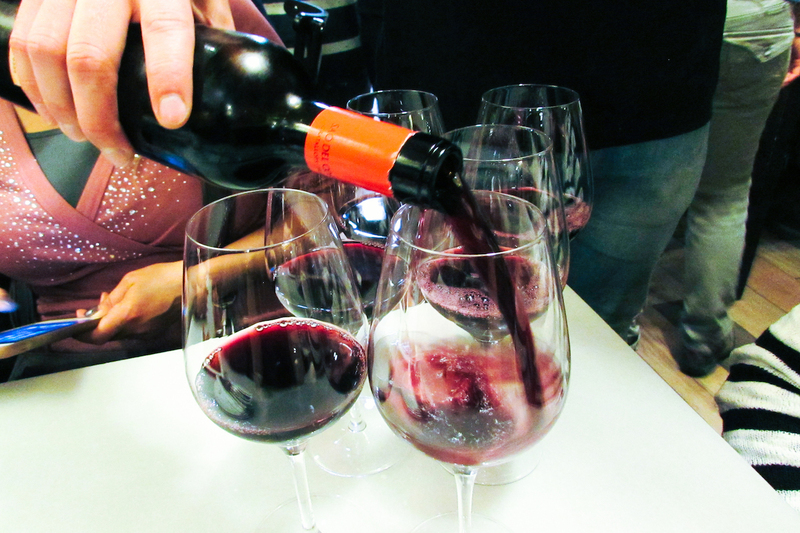 When in Catalonia, drink Catalan wine: Spain as a whole produces some of the finest wines on Earth but Barcelona, with the increasingly dynamic terroir of Catalonia right on its doorstep, is unquestionably one of the most exciting places to bebe vino. What I’m trying to get at here is that, although you will find all sorts of excellent Spanish wines in Barcelona’s wine bars, I highly encourage you to spend most of your sipping hours (and euros), exploring local Catalan wines. Catalan wine regions: There are 11 Catalan D.O.s (Denominació d’Origens), each producing high-quality and distinctive wines. 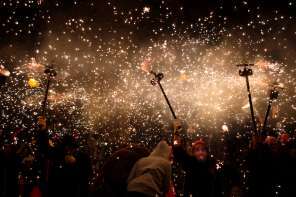 These are Alella, Cava, Conca de Barberà, Costers del Segre, Empordà, Montsant, Penedès, Pla de Bages, Priorat, Tarragona, Terra Alta. My favourite Catalan wines include white wines from Empordà and Penedès, and reds from Priorat and Montsant. Not to forget cava, which is basically the exact same thing is French champagne), from the Cava D.O. and Penedès. How to order wine in Barcelona: Remember that in Barcelona you order “un vino tinto” (tinted wine), not “un vino rojo” (red wine). Or go full Catalan and order “vi negre” (black wine). To order white wine, ask for “un vino blanco”. Typically, if you ask for “un vino tinto” or “un vino blanco”, the staff will ask if you want something sweet (dulce) or dry (seco), and make a recommendation. The wine will almost always be excellent, but if you’re on a mission to try as many Catalan wines as possible, I suggest asking for “un vino de X“, replacing X with one of the wine regions from above. If not, the wine could be from pretty much any part of Spain. 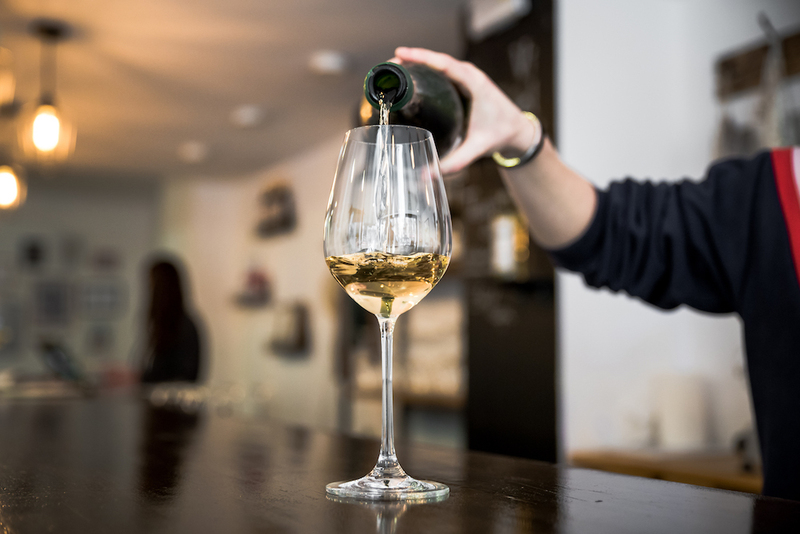 Wine culture in Barcelona: Drinking wine in Spain, particularly in Barcelona, is a relaxed and refreshingly unpretentious affair. The simple but joyous act of supping a glass of good wine, whether alone or with friends, is intrinsically woven into the fabric of local culture and everybody from teenagers to tycoons take part. The end of my street at 8am. Breakfast. More and more, it seems that younger people are setting up vineyards and wine bars, training as sommeliers and generally bringing a sense of vitality to the local wine scene. You won’t find any pontificating old fuddy-duddies in pinstriped suits boasting about their private wine cellars here. Wine prices in Barcelona are dangerously encouraging and you will find enjoyable bottles of vino at most bars and restaurants from as little as €10 (and less if you don’t mind drinking the rough stuff). … just as nature (and the wine Gods) intended. Top Barcelona wine drinking tip: There’s a huge movement in the Catalan wine world at the moment, a shift towards organic, biodynamic and natural wines. Typically produced by small boutique wineries, they’re fresh and fruity, with a unique character that works beautifully with Spanish tapas. 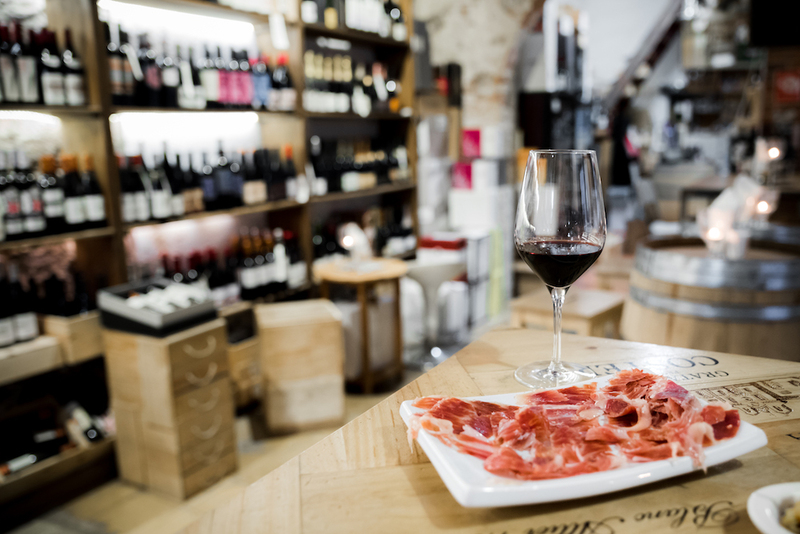 Vino tinto and a plate of jamón – the epitome of Spanish life. Probably my favourite place to drink wine in Barcelona, this traditional bodega (wine shop) has been run by the same family since 1952. It’s nuzzled away on a suitably charming street in the heart of the Born barrio, the sort of place you would have visited back in the day to fill up your gallon-bottle with rustic local wine – literally straight from the huge wooden barrels ‘a granel’. You can still buy your wine here by the gallon, litre or bottle, but today this old-world bodega also has a cosy seating area out back, where you can relax among the wooden wine crates and sample thousands of Spanish wines by the glass. There are wines for all budgets here, literally ranging from €10 to €1,000+. But no snobbery or pretentiousness – just an honest passion for wine and the vineyards that produce it. Nibbles: Pair your wine with traditional tapas dishes like artisanal olives, Catalan fuet and succulent jamón, which is delicately carved straight off the bone by long-serving team member Feddy. Tip: Bodega Maestrazgo also hosts regular wine tasting sessions and vino-related events, where the team share their favourite wines and the stories of the people behind each bottle. Check out their website for more details. 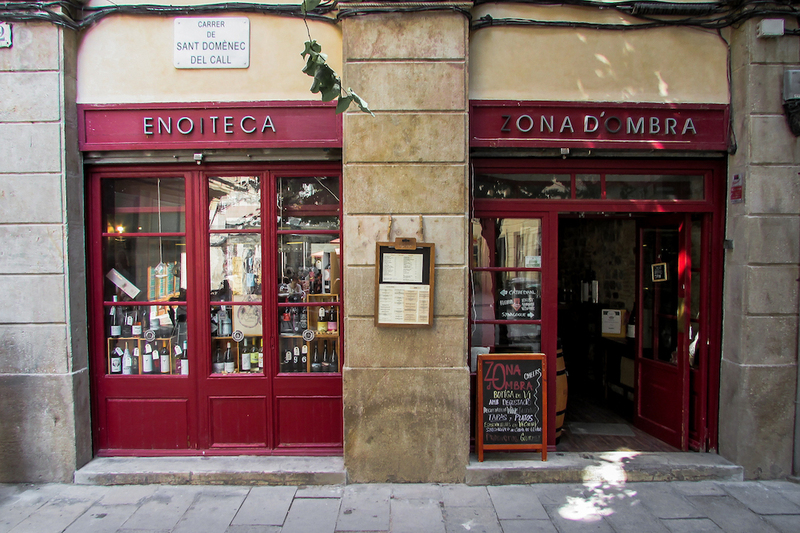 Most wine bars in Barcelona offer a variety of wines from across Spain. However, like me, the wine lovers at AmoVino believe it to be blasphemous to drink anything but Catalan wine when in Barcelona. Situated in a prime position on the ever stylish Carrer de Aribau (where you’ll also find a number of my favourite cocktail bars in Barcelona), this modern space is split into three areas: a sun-soaked wine bar where you can sip Catalan wine by the glass, a heavenly wine shop where you can buy your favourites to take home with you, and a gorgeous tasting room which hosts regular wine tasting sessions and events. I’d say that what makes the team at AmoVino so special, apart from the fact that they are entirely focussed on Catalan wine, is that they have such strong relationships with the local winemakers. In fact, many of local winemakers take over the space to talk about their latest creations during the immensely popular wine tasting events. 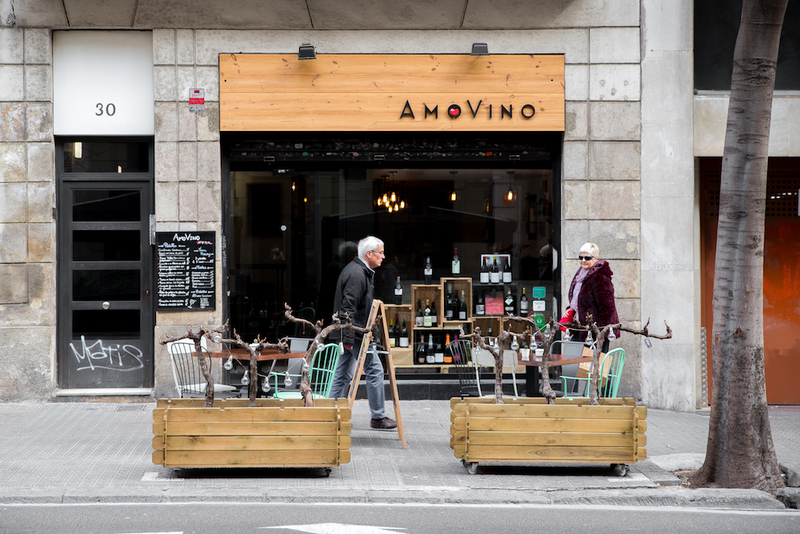 In short, AmoVino is a sanctuary for wine lovers, a sort of oenological cultural centre, an unpretentious space that’s perfect for exploring Catalonia’s thriving vino scene. Keep an eye on the AmoVino Facebook page for regular tastings and events. Tip: I highly recommend their ‘three wines and three tapas tasting platter’, which is a bargain at €15. Hidden away in the tranquil Placeta de Manuel Ribé square in the El Call Jewish quarter (within the Gothic Quarter), this is another one of my absolute favourite places to drink wine in Barcelona. It feels like uncovering a secret members only club where you can explore wines from every corner of Spain. Owner Miguel Ángel is always happy to recommend his latest discoveries and knows all there is to know about Spanish wine. I recommend trying a few reds from the rocky Montsant and Priorat wine regions (this is a great vineyard tour and tasting experience) for a taste of what global wine writers are suddenly raving about. Nibbles: Pair with a selection of sweet gourmet olives, Cantabrian anchovies and a platter of sliced Iberian ham, chorizo, salami and sausage. 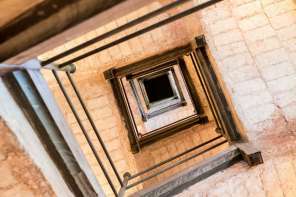 Tip: Just around the corner (Carrer de Marlet, 5) is Spain’s oldest synagogue, which dates back to the 6th century and is one of only five Medieval synagogue remaining today. 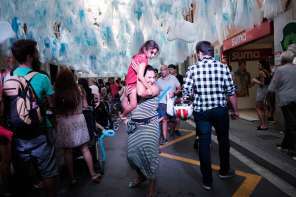 Its seemingly out-of-whack situation is due to the fact that it faces east, to Jerusalem. When you take your dog for a walk in Barcelona. 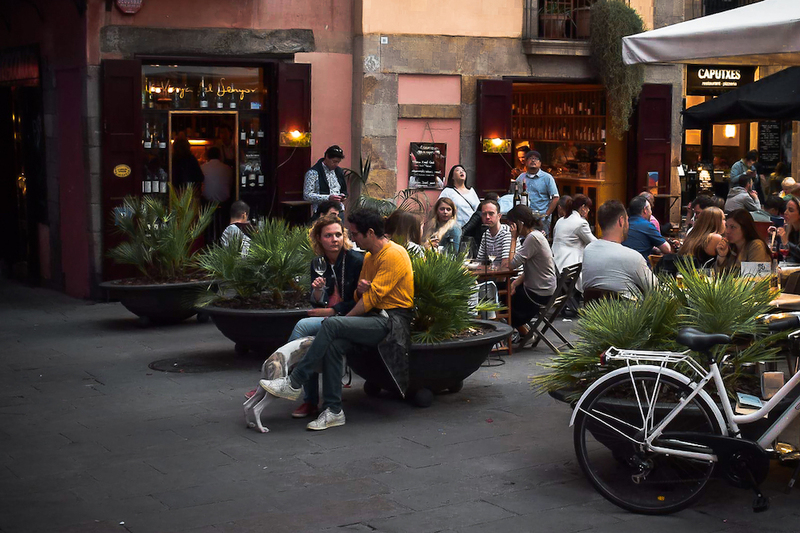 Nuzzled away in the shadow of the Gothic Santa Maria del Mar church, this itsy-bitsy wine bar is frequently lauded as one of Barcelona’s finest. If you’re lucky enough to find enough space to squeeze inside then you’ll find a few poser tables to perch at on the ground floor and a cosy, duck-or-you’ll-bump-your-head area on the upper floor. In general though the indoor space is reserved for far more important things, like cases upon cases of wine… glorious wine. Apparently there are around 400 references in stock at any one time, with around 20 of them being available to order by-the-glass at any one time. But it’s the coveted outdoor terrace that steals the show, where the fortunate few get to while away an afternoon with the aromas of Spanish vino and the grumbling sounds of the neighbouring Santa Maria del Mar’s church bells. This is a harbour for hedonists. A religious experience for heathens. Hidden away on a side street in the Gothic Quarter, this tiny little hole-in-the-wall is a tricky one to find. It’s the kind of place I’ve considered not sharing on my blog, simply because I don’t want to let the secret out. Up to 15 wines are available to enjoy by the glass at any one time, all served with a little complimentary (at least I think they were free) sliver of cheese or olives or jamón. A rumbling soundtrack of smooth jazz and happy customers creates an extremely convivial mood, with limited space so that you can’t help but enjoy the conversations of others. 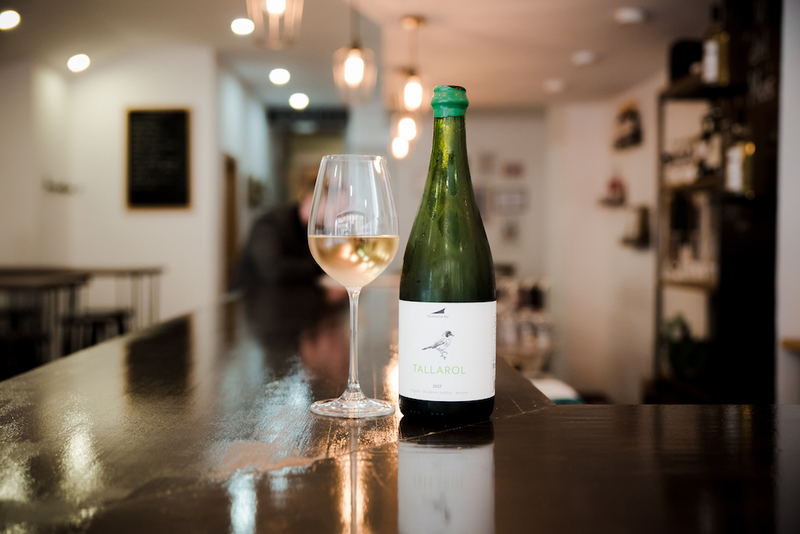 Tucked away on a side street just off Born’s main artery of Passeig del Born, Eldiset is one of the best places in Barcelona to explore the flavours of Catalan wine. 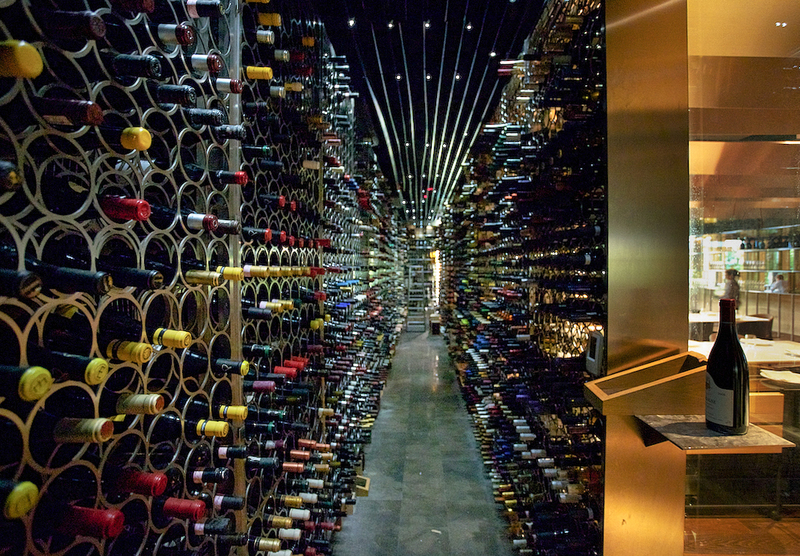 This stylish and increasingly popular wine bar reserves almost all of its shelves and chillers for Catalan varieties. Many (if not all) of the staff are trained sommeliers, making this one of those places where you can ask for recommendations and actually trust you will receive sage advice. Nibbles: Prolong your sipping time with a selection of traditional tapas. Their forte is undoubtedly the ‘torradas’, crispy wedges of toasted bread topped with the likes of blue cheese and raspberry jam, or black sausage with shavings of cured cheese and sun-dried tomatoes. In other words: food that goes well with wine. Tip: Try to reserve a table or you’ll stand no chance. Hushed vibes and stylish crowds combine to make this revered wine temple feel more like a luxury hotel lobby than a bar. But good looks aside, this much lauded sipping spot has earned a reputation for being one of the best places on Earth to discover and learn about wine. The cellar stocks thousands upon thousands of bottles from every corner of the globe, with a wine list presented in the form of a tablet (of the computer variety). You can order by the bottle, although with some 50 wines available by the glass or half glass I’d recommend ordering a selection to explore. Speak to Isabelle Brunet, co-owner and head sommelier, for recommendations. She has a genuine passion for sharing wines from Spain and beyond, and if you talk the talk she might even let you take a peak inside the ginormous cellar. Nibbles: Monvinic has an excellent tapas menu and a full restaurant – the €20 set menu del dia is an absolute bargain! 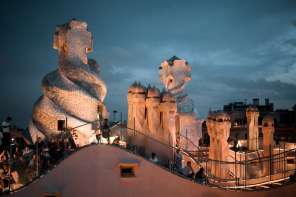 Tip: For the perfect night out, follow with a leisurely stroll up Passeig de Gracia to Antoni Gaudi’s iconic La Pedrera building, where you can watch live jazz on the roof and watch the sun set over the city. Me and a porron at El Sortidors del Parlament. Located on the ultra trendy Carrer Parlament in my beloved barrio of Sant Antoni, Els Sortidors is one of my favourite places for vino and tapas. The staff are friendly and always happy to run you through their impressive wine list. There’s a wide selection from across Spain, so this is a good option for those times when you’ve had your fill of Catalan vino. Nibbles: Perch at one of the old wine barrel tables and order a selection of gourmet Spanish cheeses, meats and olives. Don’t miss their excellent ‘ensaladia rusa’ (Russian salad), a classic Spanish potato salad with carrots, peas, apples, celery, onion, and mayo. 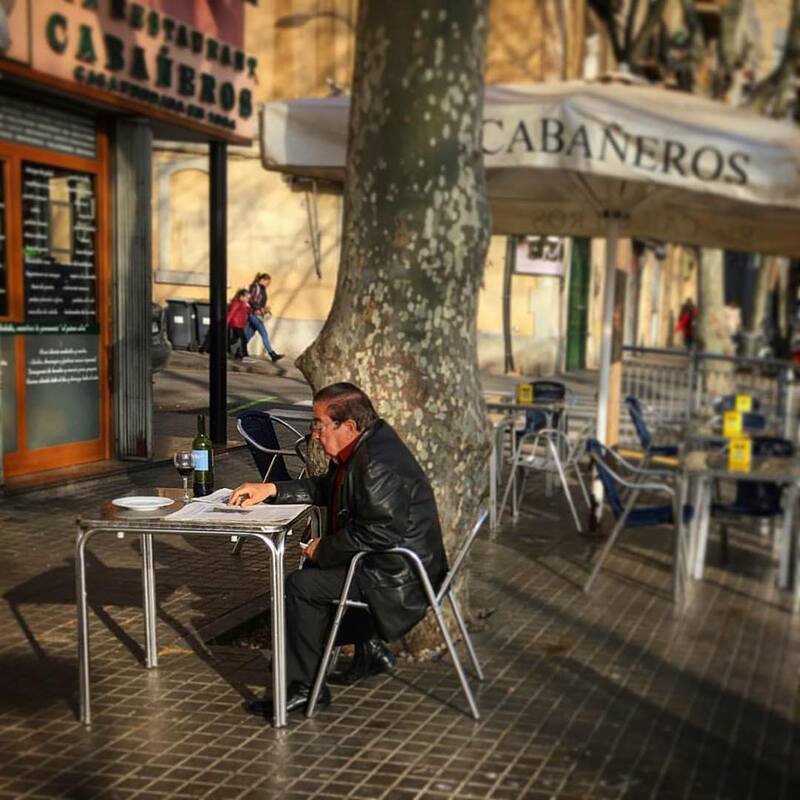 Tip: I also love Bar Calders, which is just a short stroll down the street. And if you’ve had enough wine and want to try some local craft beer, pop next door to the beautiful Barna Brew. Claartje in her happy place. Tucked away in Barcelona’s Born barrio, this gorgeous wine studio is like something straight out of an architecture magazine. 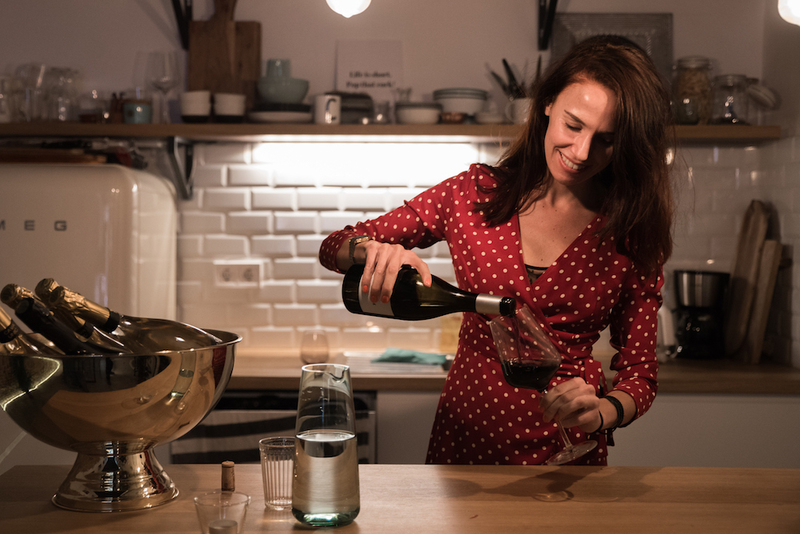 It’s run by the equally glamorous and passionate wine connoisseur Claartje van den Bogaard (or ‘Claire’ for those of us who don’t speak Dutch), who provides exciting wine tastings, courses and private events. Sign yourself up for the ‘Taste of Spain’ tasting or kick-start your weekend with the WKND Uncorked sessions. You can also buy your favourites by the bottle to take home with you. “Tell me when to stop!” ~ Fintan from Wine Cuentista. I’ve never met anyone more passionate and knowledgable about wine than Fintan. Well on his way to becoming a Master of Wine, he is the perfect guide for personalised wine tastings, pairings and tours in Barcelona. But more than just sharing his passion for wine, Fintan is a compelling storyteller (‘cuentista’ means storyteller in Spanish) and loves elevating the people and stories behind each bottle. 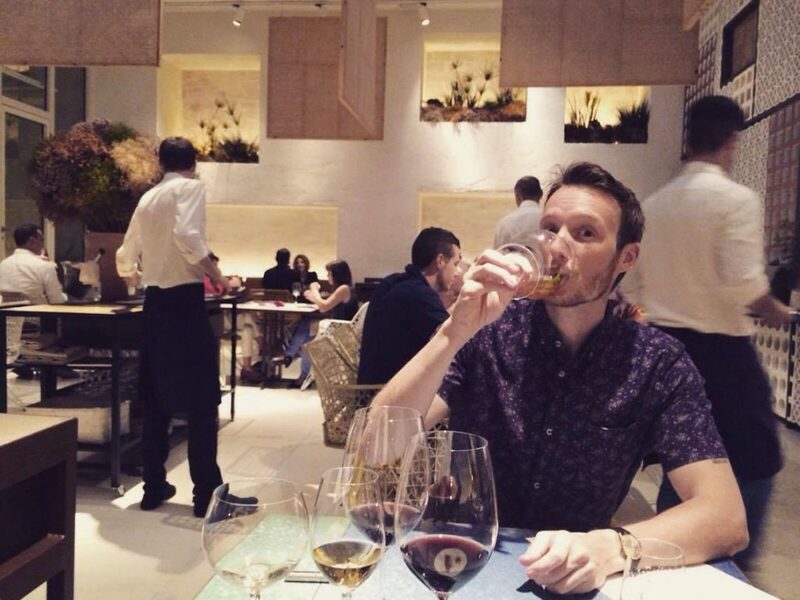 Me and a sea of wine on Wanderbeak’s ‘Perfect Pairing’ wine tour in Barcelona. 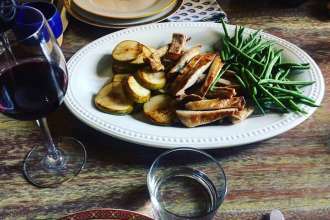 I’ve been on a number of Wanderbeak’s boutique food and wine tours and can’t praise them enough. They’re so passionate about Spanish gastronomy and culture and you can’t help but feel the same way after one of their foodie experiences. 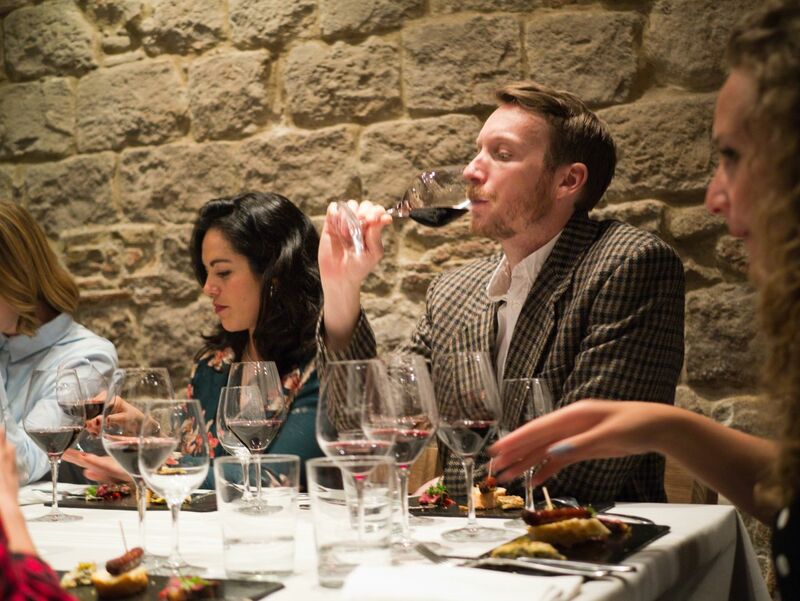 All of their tours involve wine in one way or another, but their ‘Perfect Pairing Wine Tour‘ is a particularly comprehensive deep dive into the art of pairing Spanish food and wine. Bright, bubbly and bursting with knowledge, Sharon is a truly inspiring wine teacher and runs a wide range of wine tasting sessions and courses in Barcelona. Whether you want to spend a night exploring and learning about the wines of Spain or want to get qualified as a sommelier yourself, Sharon is your guide! 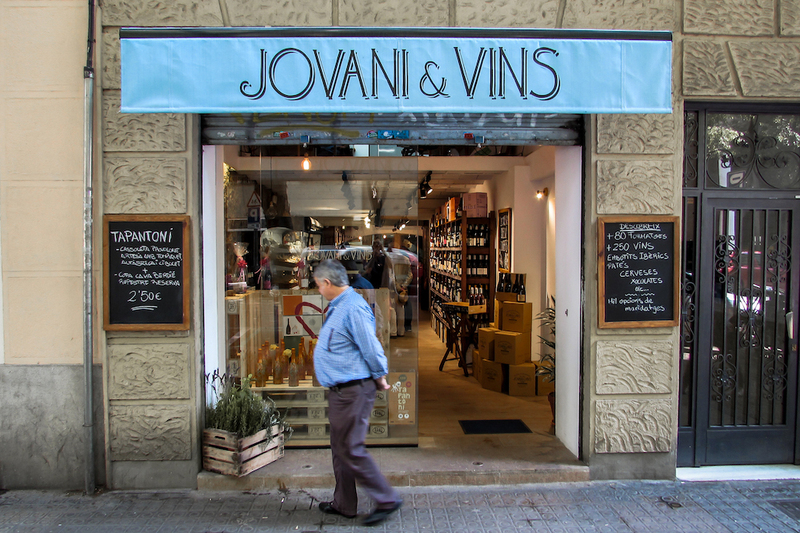 Also located in my beloved Sant Antoni barrio, this family-run wine bottle shop and tasting space is is run siblings Montsa, Sergi and Roberto Jovani, who were fortunate enough to inherit a vineyard in the nearby Penedès wine region. As well as producing their award-winning Berdié Cava, they also run cheese and wine pairing sessions. In short, if you want to taste Catalonia’s famous cava in Barcelona, this is the place! Tip: Their selection of 300+ wine bottles and beautiful deli treats are perfect for picnics at the beach/park in Barcelona. Me and my new friends feeling warm and fuzzy after enjoying the Devour wine and tapas tour. 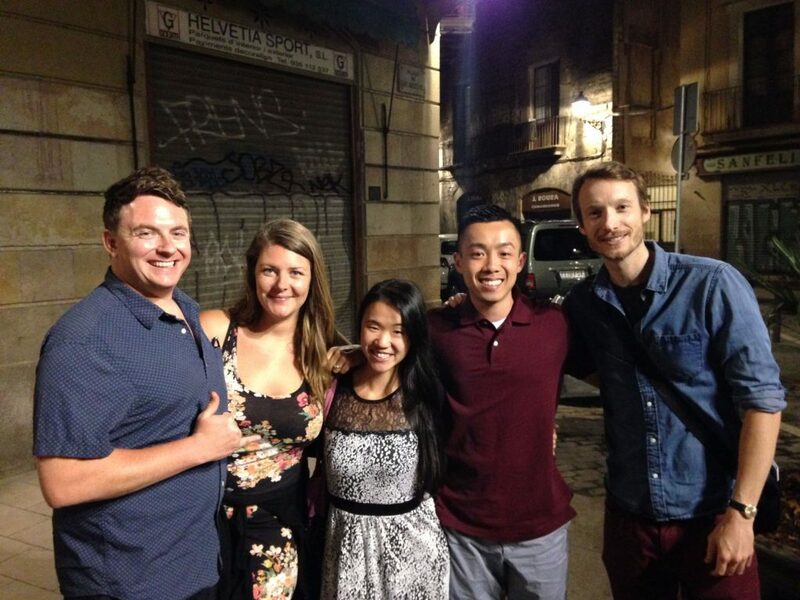 I also had a great night on Devour’s Barcelona wine and tapas tour, sipping and nibbling the night away in great company. Lots of laughs, lots of learning, amazing food and, most importantly of all, lots of vino! 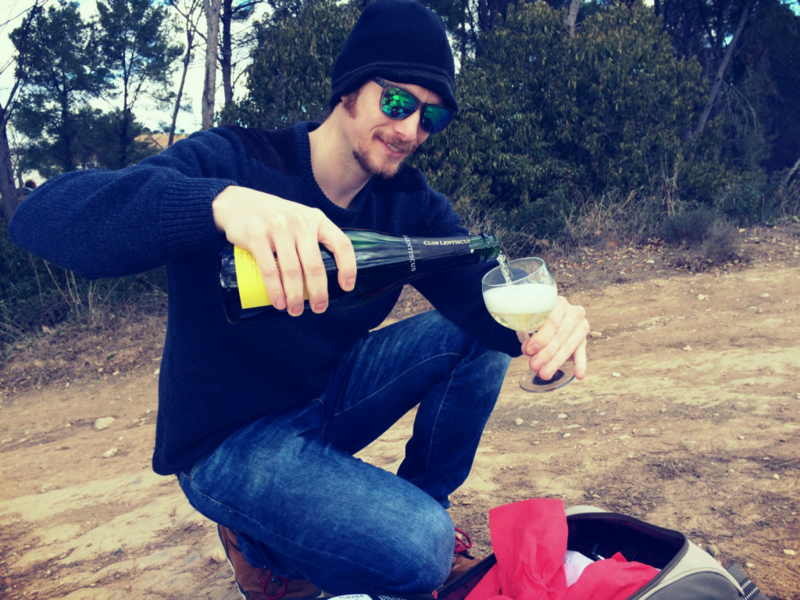 Me in a vineyard in Penedès with a bottle of local cava. The best Christmas ever! The Penedès wine region is located less than an hour away from Barcelona and is where most people go for wine tasting and winery tours. There are a number of great wine tour providers, but I can highly recommend this comprehensive wine tasting tour, which visits several of the main wineries and includes plenty of the good stuff. Other great wine tours in the Penedès wine region near Barcelona include this full Catalan wine and cava vineyard tasting tour and this 4×4 Winery and Tasting Tour. This fantastic tour full-day tour visits the iconic Montserrat mountains, the beautiful Torres winery and the famous seaside town of Sitges. Although Penedès is the nearest and most famous wine region near Barcelona, there are plenty of other areas to explore. I would highly recommend visiting the Priorat region and/or taking this fun bike tour along the coast from Barcelona to the vines of Alta Alella. 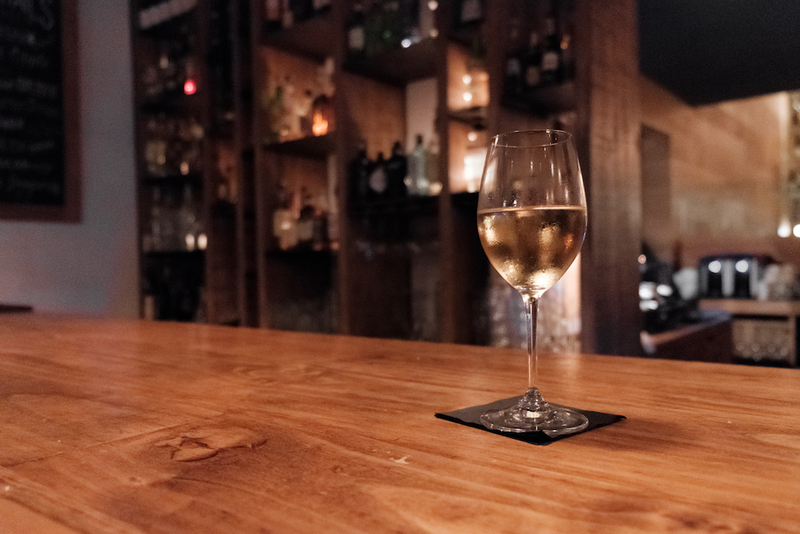 Have you been to any of these wine bars in Barcelona? Or do you have any other favourite wine sipping spots in Barcelona? Leave me a comment below and let me know all about it. 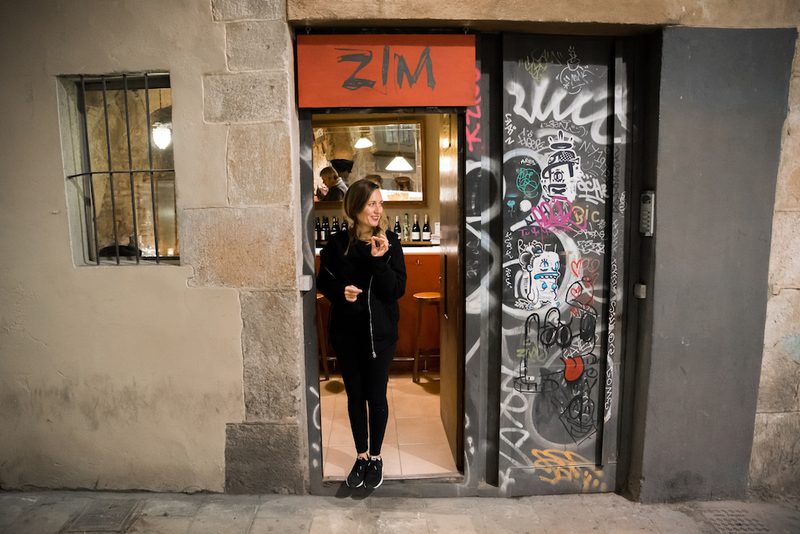 I will be updating this blog post as and when I find more excellent wine bars in Barcelona, so be sure to pop back from time to time.